10% off the first order; 15% off for 4 orders made in advance. Unlimited revisions for all orders after you order more than 15,000 words. 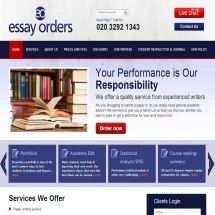 In dissertations you get a 50% discount for every thousand words after 12,000. Refer a friend and get £20 OFF your next paper or a cash reward! This review has not yet been approved by the owner of this writing service. If you are the webmaster of Essayorders.co.uk, please Contact Us to approve or remove this review. The website is informative enough and pleasantly designed, however it can be noted that some of the elements are done in less than orthodox fashion. For example, price calculator cannot be called exactly user-friendly. It doesn’t allow you to order less than 4 pages and the deadline is set not for the entire paper but for certain amounts of words: for example, 15 days for 5000 words is considered to be “standard slow”. All this makes ordering a little bit unusual. It should be also noted that price calculator is a bit glitchy at times. Urgent orders (due in less than 2 days) are made separately, which only adds to confusion. Price depends on academic level, standard of quality, delivery time and period during which you can ask for revisions (basically it is 2 weeks after delivery, but for additional fee you can increase it up to 12 weeks and even more). The site itself doesn’t give you exact prices per page due to its unusual pricing system, but it ranges from about £16.25 to £61 per page if you order all the perks there are. Phone support team works alright and answers your questions in a timely manner; chat, however, is much less helpful. All the times I visited the site it was offline and only offered to leave a message to be answered later. To do them credit, these messages were answered, but it kind of defeats the purpose of online chat. The paper received from EssayOrders was better than average but nothing really special. Peculiar, non-English wording from time to time, some grammar mistakes and so on – nothing major, but the overall impression was somewhat spoiled. However, the job was done swiftly and well before the assigned deadline, and I didn’t order the highest standard of quality. Order a dissertation longer than 12,000 and get a 50% discount for every thousand words beyond 12,000. A better-than-mediocre choice. Interface is a little bit tricky and buggy but usable enough, the writing is passable but not spectacular, customer support is sometimes helpful and sometimes absent, pricing is more or less on the level with everything else. Nothing to make it stand out in good or bad sense.